More About This Title That Car! We found the old car in the shed the very first day we moved to the farm. Dad put it under the peppercorn tree. "I'll take this old clunker down to the scrapyard one day," he said. "But you kids might as well play in it for the time being." . . . We couldn't wait to find out where that car would take us. 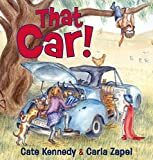 A wonderful story about three children, one old car, and a world of imagination. Join Joey, Ellie, and Luke as they travel to the Base Camp of Mount Everest, to Africa to take a safari, to Buckingham Palace to meet the Queen, and even to the moon! Wonderfully saturated and detailed illustrations bring their fantastical adventures to life. Cate Kennedy is the author of Dark Roots, The World Beneath, and Like a House on Fire. Carla Zapel is an illustrator.